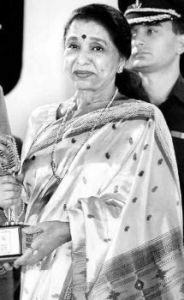 The Indian Music Academy Hall of Fame honoured Asha Bhonsle among the five chosen luminaries, Balamuralikrishna, Hindustani Classical Singer Girija Devi, Illayaraja, and Ali Akbar Khan. She was honoured by our President Abdul Kalam at a function in New Delhi on Monday, 9th April 2007, to mark the second year of the Indian Music Academy. This entry was posted on Wednesday, April 11th, 2007 at 11:42 am	and is filed under Awards. You can follow any responses to this entry through the RSS 2.0 feed. You can leave a response, or trackback from your own site.